james, love the blog! I have a question that I hope you can answer. 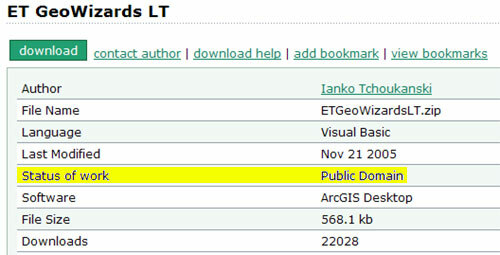 I was looking at some of the downloads on ESRI’s ArcScripts site and noticed that they are all listed as having a license of “public domain”. Downloading ET GeoWizards LT, I don’t see any of the source code included. How can ESRI allow this program to exist on the ArcScripts site if it doesn’t include the source? We’ll we’ve been down this road once or twice. ESRI has eliminated much of the commercial software so it has gotten better. Still I do find it humorous that ET GeoWizards LT does have a Public Domain license, though I’m 100% sure that isn’t the intention of the developer. ArcScripts really isn’t public domain even though ESRI claims it is. Think of it as more “non-commercial”. There are a ton of public domain/open source scripts and applications out there, but just because ArcScripts shows it to be public domain, doesn’t mean it is.